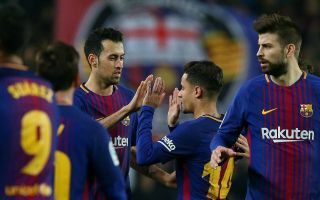 Barcelona attacking midfielder Philippe Coutinho is reportedly ready to seal a transfer back to the Premier League if his situation does not improve by the summer. The Brazil international has not really lived up to expectations since joining Barcelona from Liverpool last January, and it seems his future is now in some doubt already. According to Don Balon, Coutinho is prepared to give it until the end of the season to see if he’s playing more, but if not he would seemingly welcome another spell in England. However, despite strong interest from Manchester United, who are willing to pay £105million for the former Reds attacker, Don Balon claim his preference would be for a move to Manchester City. In truth, City don’t particularly look in need of another player like the 26-year-old, given their superb range of options in that area of the pitch as it is. It’s hard to see Coutinho getting past the likes of Kevin De Bruyne or David Silva in Pep Guardiola’s team, or even the likes of Raheem Sterling and Leroy Sane further forward. Don Balon also claim Barca want around £140m for the player – surely too much for City to pay for someone who’d be a bit of a luxury, whereas one can imagine him being a dream replacement for Alexis Sanchez or even an upgrade on Anthony Martial at United. It will be interesting to see how this one develops in the coming months.